It's really common to come across script errors while surfing on the Internet or having fun with some windows apps. Many of us has faced errors related to script throughout our life. 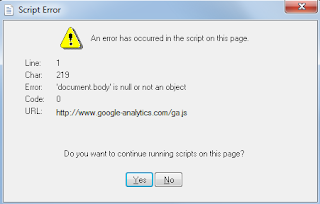 One such type of error which says that "an error has occurred in the script on this page; Do you want to continue running scripts on this page?" is seen often by the users. I got one mail from one of my reader regarding this error. This month also I have received several mails with the same problem. Now you can see that many users are facing this error. One of my friend told me that he faces this issue whenever he tries to open V7N forums. Along with his laptop started working slowly. According to the mails I received people say that they come across this error when they are using any browser such as Google Chrome, Mozilla Firefox or some media player. Frankly speaking this error will arise in almost all the apps. As this arises because of improper scripting or coding error. You can come across this issue in each and every app which is connected to the Internet. Why I Am Facing This Error? There can be several reasons for this but I have listed some most common one. I hope you may find your reasons from the listed ones. Due to improper scripting on the web pages. Hypertext template (.htt) files are damaged. Here I am going to list three methods to solve this error. Start from the first solution. If your error is not fixed then go for the second solution. In this method we'll clear all the temporary files to fix this error. Press Window key+R to open Run. Now type %temp% to open temporary folder. Select all the files and delete them. Restart your system. Hope you will not face this error in future. If your problem is not resolved through first method then navigate to the second method. If you're facing this error in Internet explorer then follow this method. Navigate to the top right corner in your Internet explorer and select "Tools"(Setting Button). Then select "Internet Options" from there. Check the following two boxes if they are unchecked; 1. Disable Script Debugging (Internet Explorer) 2. Disable Script Debugging (Other). Now uncheck “Display a notification about every script error”. Open Run by pressing Windows Key+R. Now type "Regsvr32 urlmon.dll" and then hit enter. You will see a message saying "DllRegisterServer in urlmon.dll succeeded" , just click OK. You're done. So this was all about how to fix an error has occurred in the script on this page. All the methods listed above are the proven ones. You will surely be able to fix this error with one of them. If you have any doubt or query then feel free to leave a comment below in the comment section.